The weather turned gorgeous this afternoon, so I skipped out of class a bit early and got to work on a project I've been envisioning. It felt so great to get back out in the yard and plant a few things. I'm not one of those diligent overachievers who keeps up with yardwork over the winter. I'd rather put in a little extra work in the spring and early summer to get back up to speed. What I'm trying to say is that I'm a bit embarrassed by the weeds. In a few months I'll be showing you pictures of our sparkly revamped backyard, but for now, please excuse the disarray! Since my back is still healing, I started out small for my first gardening session of the year. 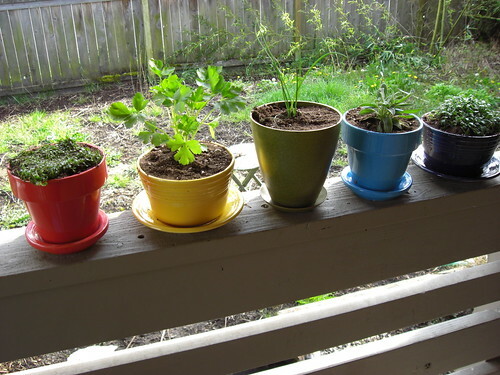 I had a collection of small pots lined up on our deck that I realized recently are reminiscent of a rainbow when arranged properly, and are also the perfect size for a little herb garden. I love all things rainbow-y. 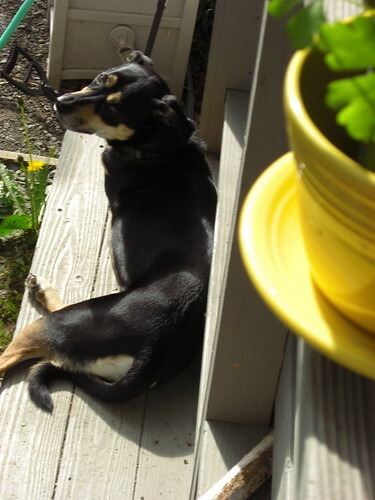 Of course, it's no fun without Oliver supervising. 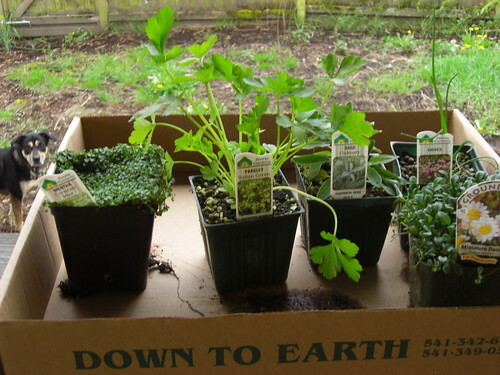 From left to right, that's Corsican mint, Italian flat-leaf parsley, chives, sage, and daisies. Can't wait to get some veggies in the ground! your new garden looks so lovely. those pots are perfect. 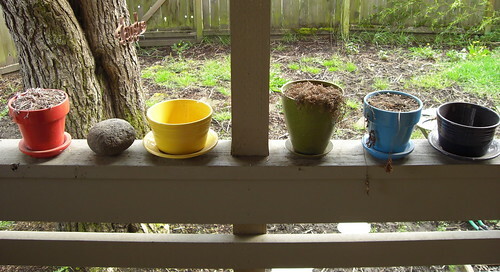 i also started a spring garden on my tiny porch.. hurray for spring! 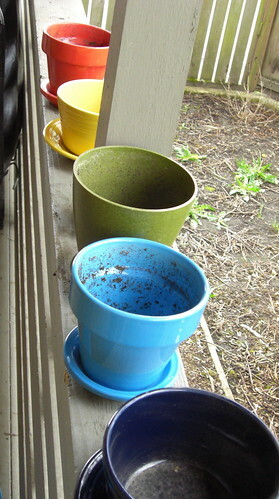 Oooh, I love love the colorful pots! !